Rev. Vincent M. Cooke, S.J. Rev. Vincent M. Cooke, S.J. became president of Canisius College on July 1, 1993. Prior to joining the Canisius College community, he served as Executive and Academic Vice President of John Carroll University in Ohio. Born in New York City and raised in Hoboken, NJ, Father Cooke received a bachelor of arts degree from Fordham University (New York) in 1960. He would also go on to receive a master's degrees in teaching and philosophy in 1962 and 1965 respectively from Fordham. 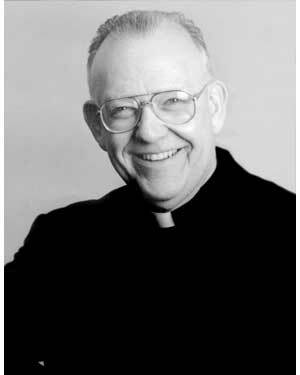 Father Cooke furthered his educational pursuits by earning advanced theology degrees from Woodstock College (Maryland) in 1967 and Yale University (Connecticut) in 1968; and a doctorate from the University of Wisconsin (Madison) in 1971. His area of expertise focuses on ethics, the theory of knowledge, and the philosophy of language. Father Cooke served as a provincial of the New York Province of the Society of Jesus from 1978-1984. From 1980-1984, he was the Chairman of the Higher Education Committee of Jesuit Provincials, College Presidents, and Rectors. He was also a delegate at the Jesuit General Congregation in Rome 1983. From 1971-1976 and 1985-1991, Father Cooke taught Philosophy to graduate and undergraduate students at Fordham. In 1987, he became the director of the Collegiate Program of the Jesuit Scholastics at Fordham's Murray-Weigel Hall, a program for Jesuit students which leads to a master's degree in philosophy from 1991-1992, acting president from January through March 1992, and executive vice president and professor of philosophy from 1992-1993. During his 17 years as President, the college invested nearly $150 million in its campus to restore and enhance such buildings as Old Main, Lyons Hall and the award-winning Montante Cultural Center. Newly-constructed, modern-day residence halls turned the once commuter campus into a primarily residential environment. And a 17-month, $22 million technology upgrade created more than 50 state-of-the-art classrooms and computer labs in Old Main and Lyons Hall. Throughout his tenure, Father Cooke made academic quality his priority. He raised academic standards at Canisius, increased the applicant pool outside the Western New York region; and made Canisius more affordable through merit-based aid and other scholarship assistance. He encouraged new undergraduate and graduate majors in such emerging fields as bioinformatics, digital media arts, accounting information systems, and health and human performance, and raised the bar on the recruitment of quality faculty. In the past 10 years, Canisius increased the percentage of courses taught by full-time faculty and lowered its student-faculty ratio. The college also introduced unique learning programs that provided Canisius’ best educators with the resources needed to focus on creative teaching techniques. Father Cooke’s win-win approach to community relations resulted in several undertakings that continue to benefit Canisius, its neighbors and the greater Buffalo community. He introduced the Employer Assisted Housing program, which provides incentives to college employees who buy homes near campus. Father Cooke’s mission to preserve, restore and revitalize historic campus buildings helped revitalize neighboring communities and spur economic development.